For many devices, it has become a must to have access to the Internet abroad. It may be due to that one wants to share his vacation photos via Facebook or Instagram with friends, or that you have to work as a business traveler outside his hotel with the laptop. The Finnish company Uros offers with their mobile hotspot Goodspeed MF900 on a solution that now dominates LTE. The previous Hotspot sold by Uros could offer a maximum 3G speed. The new model MF900, which is offered from July, is produced by ZTE and has a Qualcomm chipset (MDM9225 Gobi), which has an LTE module of category 4. The download speed to a maximum of 150 Mbit/s and upload speed to 50 Mbit/s could be achieved, of course only where a LTE network is available. It supports most 7 LTE bands. The Hotspot produces a wireless b/g/n network to 2.4 and 5.8 GHz, in which up to 14 mobile devices such as tablets, smartphones or laptops can dial in order to surf the Internet. The ZTE MF900 hotspot, which comes in the design of a smartphone and pocket fit with 125 grams, has a small display that can display the name of the used mobile network, the number of connected devices, the used data volume and the battery level. In addition, the name and password of the generated Wi-Fi network can be displayed in order to make it available to other users. The strong battery of MF900 is 3,200 mAh and can take 12 hours active use time or 7 days standby time, which is approximately the same length as a smartphone. 10 SIM card slots are available, each 5 are on each side: Taking the front panel of the instrument, shows the unique selling point of the Goodspeed router. 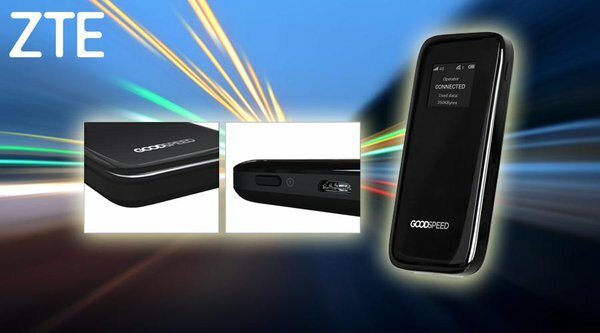 If you use the Goodspeed MF900 Hotspot in other countries, the hotspot automatically switches to the local network mode to support the available network, so you have to worry about anything. Uros offers SIM cards for 77 countries worldwide (Jul. 2015). Europe is expected to be already well covered with more than 30 countries. In Asia and in the Americas, more than a dozen countries are supported, including the US and Canada, Argentina and Brazil, Japan and Thailand. According to the provider, the number of available countries will be further expanded. Through a partnership with Vodafone, Turkey, Romania, Malta, Albania and seven African countries are added, including South Africa. The Uros Goodspeed 4G Mobile Hotspot is now available on the shop www.4gltemall.com, you can buy at a fixed price right in the shop. But you have to buy a contract from the network provider. 4gltemall.com only provides the devices, the contract SIM is not available with the device.